I didn't see Cooky at all during the long cold winter. The last time I'd seen him he told me he'd got his funeral plans worked out. These included a prayer card on which St. Peter was ambiguously posed. It would be unclear if he was welcoming you through the door or gearing up to push you down the stairs. I thought about this during the frigid, snowy days. It was good to spot him back at his familiar seat on Fifth this spring. He'd been sick for a long time, and had only just moved back home. With that nickname, how could he not like to cook? 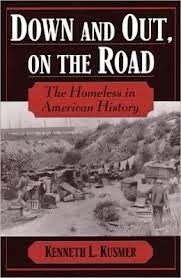 A couple of months back I passed by in time for two quite unforeseen presents: a jar of home-made tuna salad, and a copy of Down and Out, On the Road: The Homeless in American History. He'd found the book on the sidewalk, along with another one, a New York Times cookbook, from which the tuna recipe came. Cooky is good at finding stuff, from nearby thrift shops, or stoop sales, or left for the taking on the curb. When I see him, more often than not he's poring over the latest treasure. Right after I got my presents, I ran into another neighbor, a pal of Cooky's, who mentioned the Times cookbook that Cooky had found. It had become quite a topic. Next time I saw Cooky, he had the tuna recipe waiting for me, along with a large can of solid albacore in olive oil. It turns out Cooky lived on my block many years ago, and knew some of my nearby neighbors. I asked him when he moved there. "After Roosevelt died." I asked him when he moved out. "Before Bobby Kennedy was assassinated."